Sensitive skin or not most men will likely all mess up with a razor sometime (We are putting a literal blade to our necks after all). 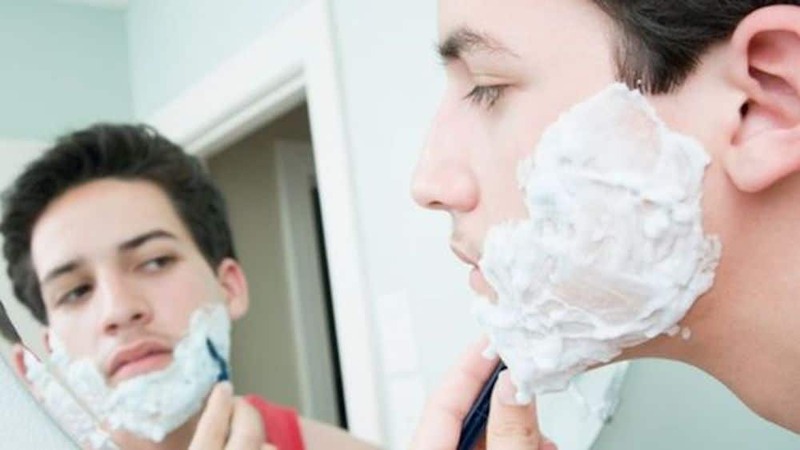 “If the average man starts shaving at age 13 and continues until he is 85 years old, and assuming he spends all of five minutes shaving each day, he will devote over six months of his life just to shaving his beard.” That’s a lot of potential for nicks, razor burns, bumps, ingrown hairs and inflammation if you don’t know what you’re doing. Lucky for you, we do and in this article, we’ll be showing you the seven very best razors for sensitive skin. 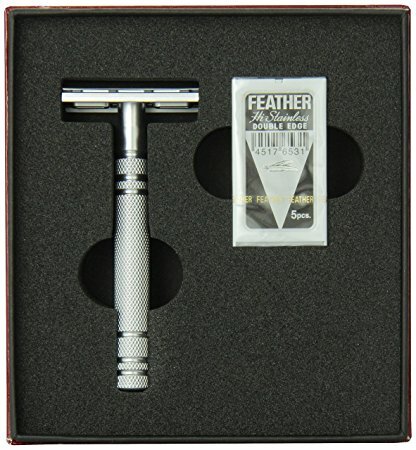 “You get what you pay for,” couldn’t be a more apt description for the most expensive razor on our list: The Feather stainless steel safety razor. Handcrafted in Seki, Japan, it was one of the first razors to be made from stainless steel, which means it was built to never tarnish. 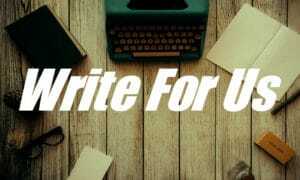 Replace it’s blades when they dull and it’ll last you a lifetime. It also has a great weight and grip with a head that tilts an extra 15 degrees then regular razors. Despite its blades being katana sharp, it’s actually considered much less aggressive than many of its peers, meaning you can apply some pressure without having to worry about irritation. It’s one of the most accessible and innovative razors around with some of the best shaving blades on the market. What more could someone with sensitive skin ask for? Gillette has been in the business over a 100 years and with a name that’s become synonymous with shaving it’s clear they know what they’re doing. 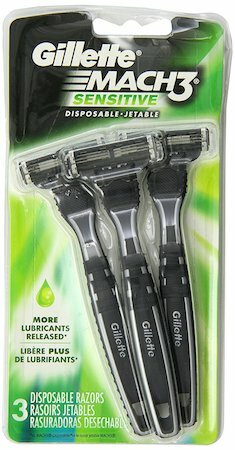 It’s become a trend to add exuberant blades to disposable razors but the downside of this is that it often plagues those of us with sensitive skin. The Mach 3 offers a compromise with a blade positioned to take 3 strokes for every one you move and with a spring-mounted control system which adjusts to your skin. It’s also perfect for the sensitive neck area. Along with a pivoting head, it comes with a lubrastrip that defends against irritation by releasing natural oils. It can also conveniently turns white to indicate when it needs replacement. K-pop is currently soaring over here in the west, but it shouldn’t mean we overlook what else South Korea has to offer. The world’s first precision seven blade razor by 60-year-old family business Dorco is one such example. 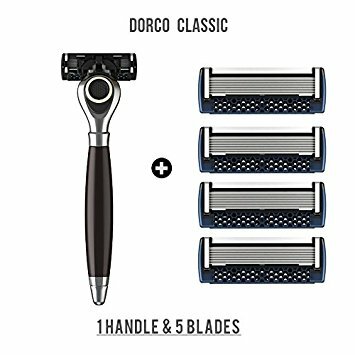 Though we just warned about multiple blades being troublesome for sensitive skin, Dorco combats this with sharp, easily rinseable blades, a pivoting head and a dermatologically-tested design. The improved lubrication strip also includes argan oil among other antioxidants which soothe and nourish your skin. 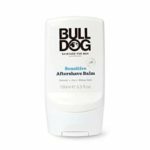 These relieve you of any bumps or burns whilst the Calendula Extract imbues you with a healthy glow, eliminating the need for aftershave. Cornerstone began as a crowdfunding project and has since transformed into a Modern British success story. 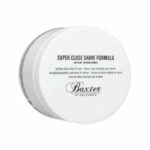 Founder (and fellow sufferer of sensitive skin) Oliver Bridge, created Cornerstone with the sole purpose to transform shaving from a daily chore into a “familiar personal ritual that gets your morning off to a great start”. A sleek German-engineered razor made of Japanese chromium steel, it has five blades specifically designed to minimise irritation while an aloe vera strip soothes with every stroke. Sophisticated yet affordable, the razor is available through the company’s tailored subscription service and delivered right to your door. Another heavy hitter. 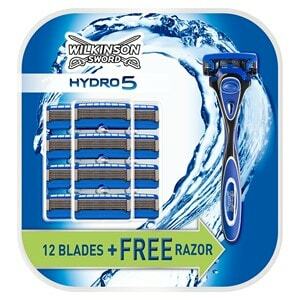 Wilkinson Sword has been in the shaving game since 1962 so they know a thing or two about a close shave. The 5 German engineered blades come with protective guards to stave away irritation and redness while (as the name suggests) the Hydro 5’s gel thoroughly moistens the skin. An in-house study found the moisture lessens friction by 40% more than the average lubrication strip. Though “you get what you pay for” may have been a perfect description of the stainless steel feather, it isn’t always true. This is exemplified with our next razor: BIC Twin select. What Bic have over the others on this list is an incredible value with 10 razors for under a fiver! 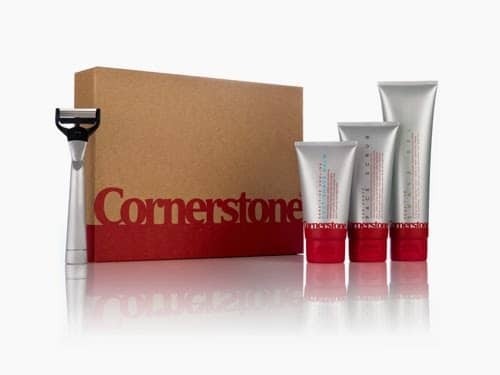 Yet somehow they still deliver a close, irritation-free shave to sensitive skin. Because of their quality and price they’re also perfect for first-time shavers, along with those who aren’t wanting to splash the cash yet refuse to compromise on a satisfying close shave. There are some cons for that price point, however: Once the blade dulls the whole razor will have to be disposed of meaning the price will all eventually add up. 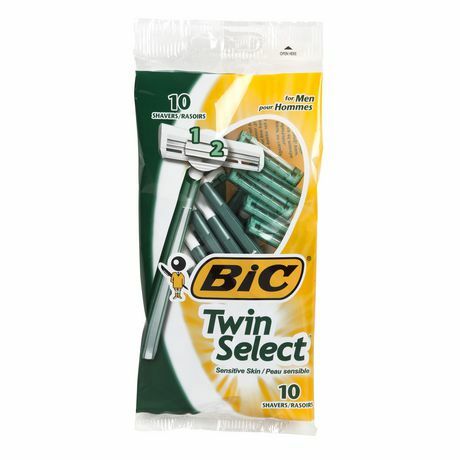 Bic Twin Select also are lacking the aloe vera strip found on many other twin blade disposables. You’ll definitely want to use a good balm or moisturiser afterwards. 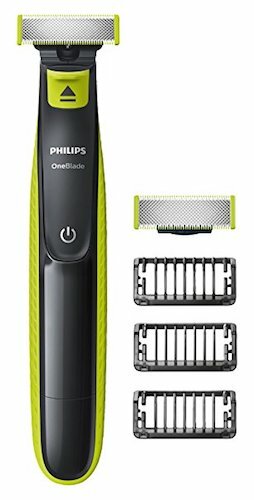 I’d say the first electric razor in the list but Philips hybrid trimmer is just that, a hybrid. Part shaver, part razor, part trimmer, it’s all thanks to a single blade which moves 200 times per second. The OneBlade cuts incredibly precisely with 3 interchangeable comb-lengths, so if you like to vary up your facial hair, it may just be perfect for you. The blade doesn’t cut super close either, keeping your face safe from razor burns and bumps. It lasts up to four months and as it comes with an additional blade too, you can round that up to about 8! The OneBlade works on both dry or wet-with-foam skin. It’s waterproof too (like you needed more reason to pick one up). Now we’ve been through the best razors for your sensitive skin, it’s time to briefly go through the steps to ensure you have the very best shaving experience you can. Shower (Or at least wash your face). Warm/Hot water and steam will work to soften your facial hair and exfoliate your skin. 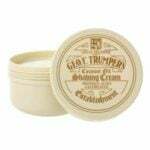 This will clear you of any accumulated dirt/dead skin and set you on the path for the perfect shave. Apply a shaving oil (if you have one). A good oil will help lift the hairs and make them easier for cutting. On top of the oil apply a good quality shaving cream. Although it may be tempting to foam up a Santa-Claus beard or the like, resist the urge! If there’s too much cream the blade won’t be able to cut as closely. Check your blade is sharp. This way it doesn’t pull/tug at your skin, which would lead to will lead (you guessed it) irritated skin. Go WITH the grain (If you’ve got sensitive skin it’s for the best unless you want ingrown hairs and inflammation). Let the weight of the razor do the work and move your arm rather than your hand to sustain that ideal 30-degree angle. Clean the blade. Do this frequently between strokes for the build-up of hair and cream encourages irritation or worse infection. Splash your face with cold water to close the pores and wash away any residual cream. Use a high-quality moisturiser to return some of the lost moisture to your dry skin, doing this will greatly reduce the risk of inflammation and irritation further. So there you have it, the 7 best close shave razors for sensitive skin. There’s a variety of different blades here to suit a plethora of tastes and budgets but don’t worry, whatever razor you end up choosing you won’t go wrong. Now armed with both a new razor and our guide, we hope your sensitive skin won’t be a burden any longer. Happy shaving. 25 Awesome Short On Sides Long On Top Haircuts For This Season!